When we rehabbed our home 3 1/2 years ago, I really wanted Tiffany lighting everywhere on my first level. It was “in” at the time, and I liked how it paid tribute to the time period of the original architecture. But I’m very fickle, and less than 3 years later I wanted all new fixtures. 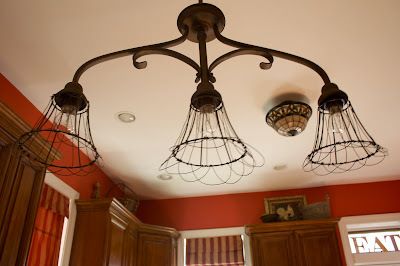 Obviously that wasn’t in our budget, so I got creative (which you can read all about in this post ) and made my own new-Victorian-cage-lighting. Hmmmm….meh. I tired of this too after a few months. Those bare-fake-Edison bulbs just weren’t doing anything for me. So today, I decided to cover them in burlap. What’s our niche’s mantra? When in doubt? Burlap to the rescue! Isn’t that it? No? Quatrefoil to the rescue? Vinyl? White slipcovers? Anyhow, I took down all my nakey cage lights and dressed them today. I avoid sewing at all costs and don’t do patterns either. So to cover the large “shade” which is really just a large wire basket, I wrapped it in burlap and clipped it tight around the edges like so. Next, I trimmed the excess fabric. For the center, I traced around the outside of the basket, cut the burlap, and then glue-gunned it all together. Yes, glue-gunned is my latest verb. And OUCH! Burlap is extremely porous and I nearly blistered all fingers making these shades! I wanted my “basket liners” on the inside of my shades. Here is a close up of the glued edge. It’s not perfect, but you can’t tell thast from a distance. So let’s back up by all means! And here is what it looks like hanging up! Pretty cute. And this picture doesn’t do it justice, but the texture of the burlap looks fantastic when lit up. Next, it was time to cover the pendant shades. Ah, so much better with some clothes on! To make the shades, I freehanded a pattern and made adjustments as needed. Once cut, it was just a matter of gluing the fabric in place! Voila! Cute new lighting! I’m really liking the look and loving that with some fabric and creativity you can create “new” lighting for yourself too! Glad I read this. I am recovering my lampshade with burlap and never even thought about the fire hazard! Thanks for the tip. Where do you buy that stuff? Now this is one "cool" idea…love it! 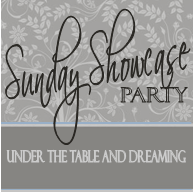 Come by and show it off at my NTT party. Hi Bet, This is the reason I love to visit you!! You are one very creative lady. I love the burlap cages. I'm a new follower and I'm working on a project with burlap too. Your lamp shade is a really different idea for burlap. Visit Mel's Cabin for a follow-up post and enjoy a cup of coffee with me. You are soooo clever, girl! These are gorgeous! I'm floored you created the wire part too out of normal lampshades! Very cool – love them! Great job using fabric, without having to sew it 🙂 yay! Oh, I love, love, love! It is true that burlap makes everything better! These are so cute! Burlap has definitely become my go-to fabric also. Thanks for the tip on the No Burn spray. Beautiful! And the fire hazard comment made me laugh because my face was all squished up thinking,"is that going to catch on fire?" and then voila, a picture of that fire retardant came up. Hilarious. And the comment about it's nice to have some clothes made me laugh, too. They are simply beautiful, and fun! I will tell you though that I love tiffany lighting, and have a ton of it in my house. I'm old school, what can I say? It turned out so cute! Love texture! This turned out so cute! I love the feel of your kitchen now. The shades accent the new color so well. All Things Heart and Home! Yeah they definitely look better with some clothes on! Loving the look. I wish you and your glue gun burns a speedy recovery!! These look great! I love the way they look lit up especially. And that spray is genius. I'll have to keep that in mind if I ever do any projects like this. When I think you can't come up with more… BAM! You do something super cool and amazing! Love it! Can't wait to hang out and laugh with you Bethy-poo! They look fantastic, Beth! 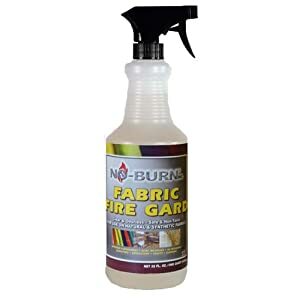 I had no idea that there was even such a thing as No Burn Fabric Fire Gard! Where'd you buy it? NEVER MIND see the Fabric Fire Guard, AWESOME! Good job! Are you feeling like a smart cookie? 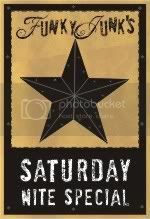 You oughta be! These are just great, Beth. I love what you did with them.